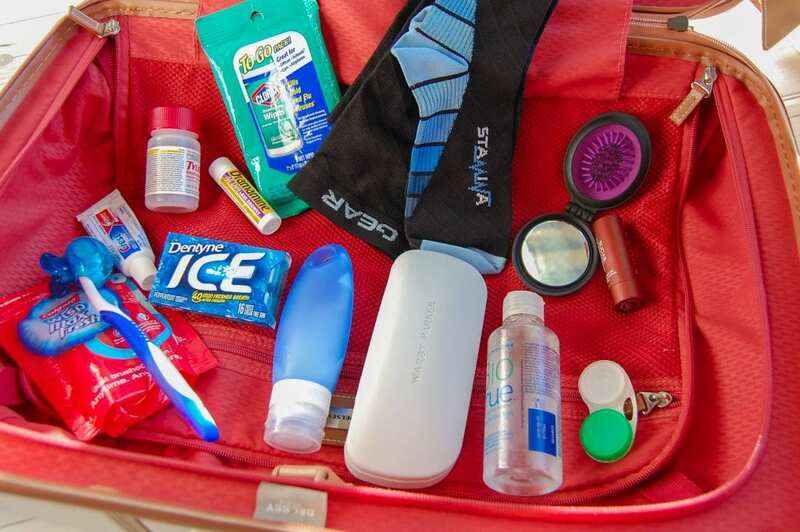 Looking for tips on what to pack in your carry-on? You’ve come to the right place! I used to dread flying. I was uncomfortable, bored, and could not wait to reach my destination. But over time, I started to really enjoy flying. That’s because I learned what to pack in my carry-on to keep me comfortable and entertained on even the longest flights. I’m sharing what I’ve learned with you, with the hope that these tips will improve your flying experience, too. We can all benefit from a few more happy flyers! To improve your in-flight experience, you first need to improve your level of comfort on the plane. I have an easier time falling asleep on the plane if I can elevate my feet. That’s where a thin, flat bag comes in handy. This bag doubles as my personal item and my footrest during the flight. I can lie it flat underneath the seat in front of me and prop my feet on top of it. And voila! Elevated feet and instant zzzz’s for me. Forget the big, squishy pillows that take up way too much room in your carry-on. Get yourself an inflatable neck pillow. These bad boys deflate to almost nothing, so they barely take up any room in your carry-on. Plus, you can inflate them as much or as little as you want. That means you can adjust to different types of headrests and your desired level of cushion. I’m a big fan of the multi-functional scarf. I bring a scarf in my carry-on because it packs down easily and serves the dual purpose of either a blanket if I’m cold or a low-back pillow if I need the support. Once I get to my destination, I use it for added warmth or a cover-up. 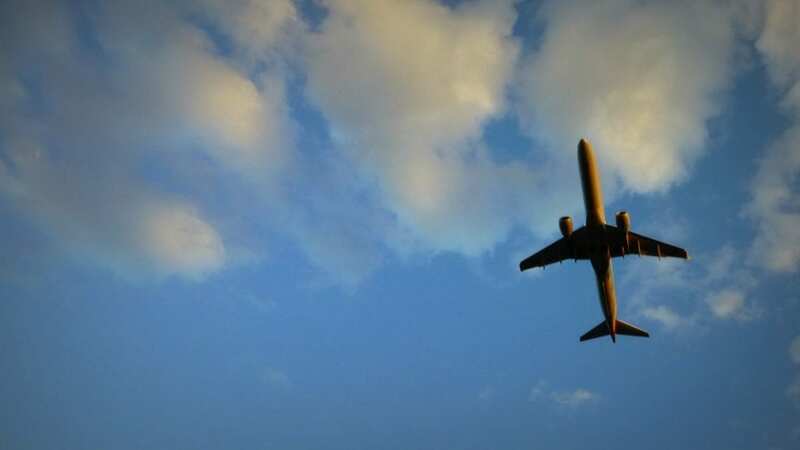 Because you don’t move around a lot on flights, the risk of blood clots increases. Compression socks can help lower that risk. Plus, compression socks are great for reducing ankle swelling and proving added warmth on the plane. There are germs everywhere on the plane. And that includes your seating area. Do your health a big favor and wipe your seating area down with antibacterial wipes as soon as you get to your seat. Bring a couple of extra wipes for your neighbor and make a BFF for life. If you succumb to the dreaded motion sickness like I do, bring some motion sickness medicine for the flight. While you might be fine for most flights, there are some flights with crazy turbulence out there. If you’re not prepared with motion sickness medicine, then you might end up being miserable for several long hours. 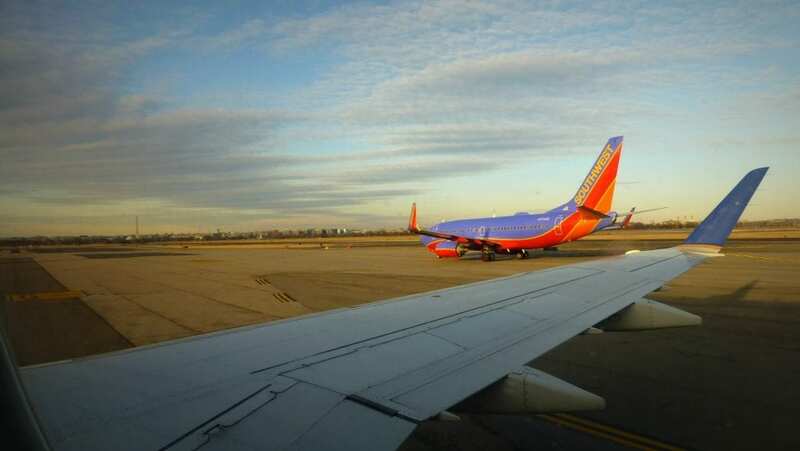 Headaches and aches/pains are no fun wherever you get them, but being on an airplane emphasizes your discomfort. Throw your go-to headache/pain reliever medicine into your carry-on for easy access. You should never, ever check your prescription medication. Lost or delayed checked bags are common. Don’t risk your health by putting your prescription medication in your checked bag. A fresh mouth is a happy mouth (and your friends and family will thank you). In addition to freshening breath, spearmint can wake you up as you’re walking off the plane into a new time zone. It gets dry up there on the plane! Do your nose a favor and bring some Kleenex so that you don’t rub it raw with airplane napkins. If you’re blessed with poor vision like me, eye care is an essential carry-on item. There’s something so nice about running a brush through your hair after a long flight. Bring a small, foldup hairbrush in your carry-on. Even if you’re taking a short flight, delays can stretch out your time in the airport and on the airplane. Reduce your frustration with some good entertainment to keep you occupied. I use my tablet as my primary source of entertainment on airplanes. I download ebooks from my library (for free! ), download Netflix videos, and download magazines. While the combo of an eReader and laptop could do these functions, I find a tablet to be a good multi-purpose electronic for the airplane. I already have my phone with me on the flight, so I try to make it useful for in-flight entertainment. Before a flight, I’ll download several podcasts. This is especially handy for flights where I’m struggling with motion sickness and need to avoid reading and watching movies. With a podcast, I can sit back with my eyes closed and just listen. My brother (who got his master’s in acoustics) recommended these babies to me. They’ve been a total game changer. In the past, I blasted my eardrums to hear audio over the airplane engines. Not with these headphones. They drown out ambient noise (like airplane engines) so that you can listen to movies, podcasts, and music at a normal audio level. Your eardrums will thank you. I like to have a non-electronic source of entertainment handy in case something goes wrong with my electronics. I’ve had multiple devices short out or die at the same time. A long plane ride can be pretty miserable if you don’t have anything to keep you busy. Some airplanes have chargers on the plane, but you shouldn’t count on it. Bring a portable charger to charge your devices on the go. Don’t be one of those sad people at the airport chained to a charging station. If you’re bringing an expensive camera for your trip, don’t put it in your checked luggage. Unfortunately, expensive items have a habit of disappearing from checked luggage. Keep it safe with you and capture travel images in the airport and on the plane. I love watching videos of all aspects of travel – including people’s journeys navigating through new airports. 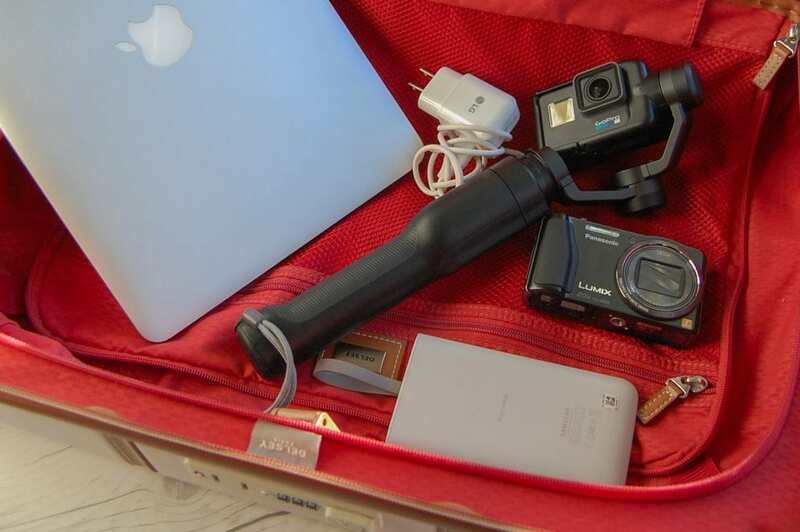 Throw your GoPro in your carry-on for an easy way to video your airport adventures. If you’re bringing a laptop, don’t put it in your checked luggage – unless you’re hoping for a broken laptop. Pack your laptop in your carry-on. Pack in your carry-on any chargers you’ll need for the flight and the first 24 hours after landing. Checked luggage has a way of not making it to where it needs to be in a timely manner. Plan ahead by having all the chargers you’ll need. The food you eat and beverages you drink have a direct relationship to how you feel. That seems even more true while flying. If I eat sugary or salty foods or become dehydrated, I feel lethargic. Being on an airplane can already be uncomfortable. Dehydration is my personal enemy while traveling. I’m more energic, more insightful, and less likely to get sick when I’m hydrated. I fill up my water bottle before getting on the plane and refill it several times on the plane. You can ask your kindly flight attendant to fill up your water bottle for you from their drink cart. Or you can use the water spigot in the galley. If you’re worried about germs in the water, bring a water bottle with a built-in filter. 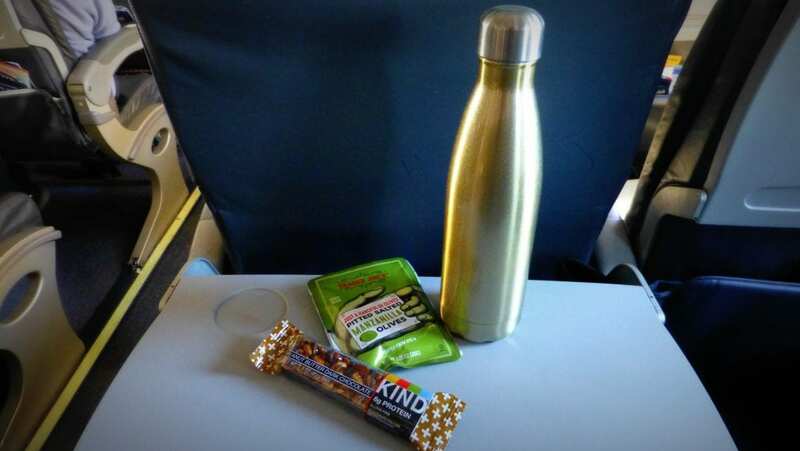 Airports and airplanes generally don’t have the healthiest snacks. Bring your own snacks instead. I pack granola bars and trail mix in my carry-on. If you’re checking a bag with most of your clothing, make sure that your carry-on includes at least one day’s change of clothing. I’ve learned the hard way that checked luggage doesn’t always make it to your destination. This usually occurs late at night or on a Sunday when the stores are closed. Pack a change of clothing in your carry-on so that you’re not stuck wearing your airplane clothes for several days in a row. Lithium batteries (like those in drones) need to be packed in your carry-on. Read through what you can and can’t put in your checked luggage, or else you might reach your final destination and discover that a key item was confiscated by airport security. Don’t put any valuables or items you’re worried about losing in your checked luggage. All my jewelry was stolen from my checked luggage on a flight once. Luckily, it was replaceable, non-heirloom jewelry. But I learned my lesson and keep my valuables with me now. What carry-on should I use? 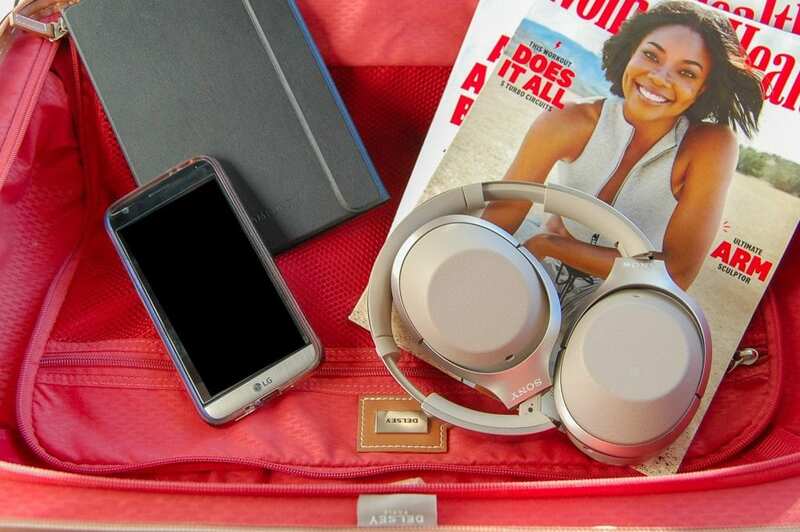 After you’ve got your carry-on essentials, the next step is to find a great carry-on to use. I favor four-wheel roller bags for all my luggage. 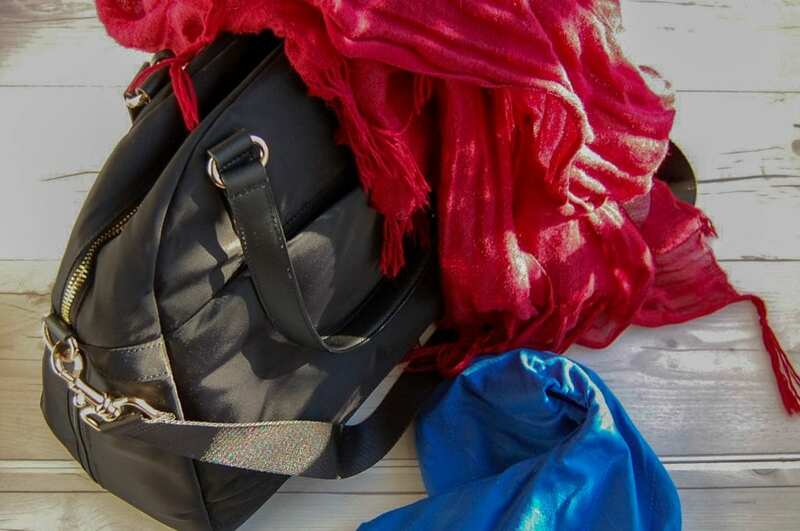 Although a duffel bag can be more convenient as a carry-on, it can be a heavy burden to lug around. Lugging a duffel around a big airport gets old in a hurry. And it’s not great for your joints. 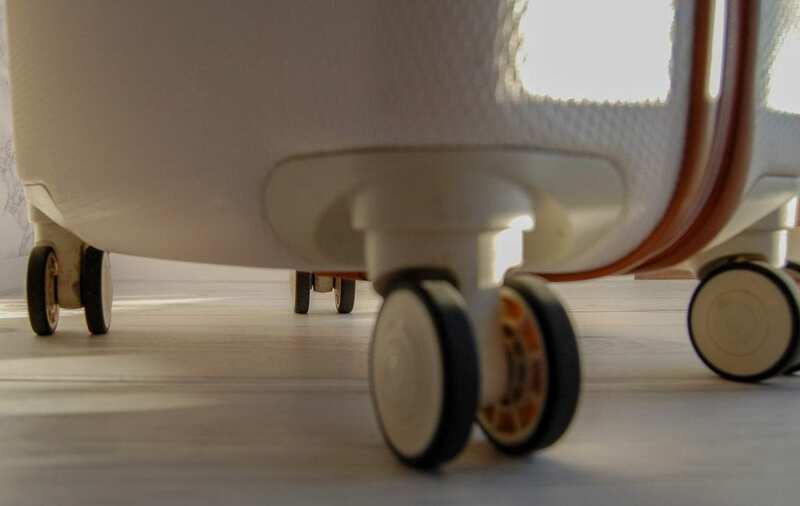 Save yourself the burden and get rolling luggage for your carry-on. Before purchasing your carry-on, consider carry-on size restrictions. Many U.S.-based carriers have a carry-on size restriction of 9 inches x 14 inches x 22 inches (22 cm x 35 cm x 56 cm). 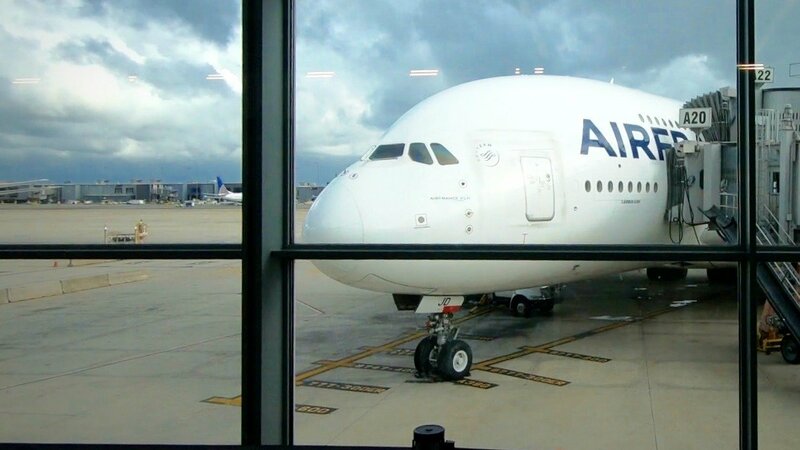 But you may find that carry-on size restrictions are smaller on flights outside of the U.S.
For example, when flying from the U.S. to France, you’ll likely have U.S. travel size restrictions. But if traveling within France from Paris to Nice, you may have smaller size restrictions. Check the carry-on size restrictions of each flight you’re taking (even if it’s on the same airline) to confirm carry-on size restrictions. If you’re not careful, your carefully packed carry-on might end up getting checked due to size restrictions. For my top, I wear a slightly-fitted, long-sleeved top. I bring along a scarf to layer on top of my shirt if the plane is chilly. For pants, I wear slightly-fitted, long pants. I don’t want anything that squeezes my middle too much, since that can cause indigestion and acid reflux. I wear compression socks under my pants to help reduce my risk for blood clots. For shoes, I wear slip-on sneakers so that I can easily take them off as soon as I get to my seat and want to get comfortable. What should I do before I get on the plane? Charge all electronics, including my portable charger. Don’t be the person tethered to a charging station at the airport. Download ebooks. I get mine for free from my local library. Buy or make any snacks for the plane. I hope these tips help you to have a great flying experience! My battery nausea relief band has been a godsend. I wear it for all trips and take an extra in case the first would break. I also carry spare batteries since I really don’t want to be without this. I’m always looking for better ways to manage my motion sickness – will have to check that out!